Where the heck has Michael Keaton been, you may ask yourself, and who cares, anyway? See director Alehandro Gonzalez Inarritu’s spread of spectacularly broken characters in Birdman and you’ll have your answer. It includes Keaton’s starring, and possibly award-winning turn, as a washed up superhero looking for a comeback and acceptance as a “real actor”. You’ll also see the great collection of actors surrounding him. Together, they bulldoze, bully, and bare their souls through the perfectly cast film. You’ll vacillate between wonder at why we haven’t seen Keaton sooner, and amazement that he had the patience to wait for such a career-defining role. Birdman is basically a movie about putting on a play, but that is the foundation of a multilayered cinematic construction with much more on offer. It is a black comedy that is kinetic, in-your-face, and cerebral all at the same time. It examines what it means to be a has-been, or see yourself as one, and how throwing everything into wanting more, even after everyone has said you’ve gotten enough, can lead to disaster, redemption, or a little of both. It does all this while playing with the idea of subjective vs. objective reality and the power of perception. Sound too heady for you? It is also full of the sort of dark and twisted humor only the most dysfunctional people can best appreciate. Those of you who have seen the darkness in your own psyche, who have dipped your toe into moments where the line between what is real and what is imagined are difficult to discern, will fall for every human train wreck portrayed here. 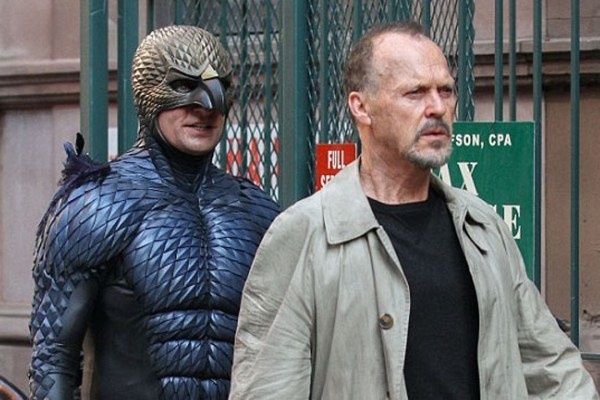 Aging and down-and-out actor Riggan Thomson (Michael Keaton) once played the iconic superhero Birdman, but is now seen as a laughable shell of his former successful self. He wants to regain respect in what he sees as an authentic way, by directing and starring on Broadway in his re-worked version of Raymond Carver’s short story “What We Talk About When We Talk About Love.” His daughter Sam (a never-better Emma Stone), just out of rehab, is acting as his personal assistant. One of the play’s co-stars Lesley (Naomi Watts) introduces a replacement actor for the show in her famous theater actor boyfriend Mike (Edward Norton), who winds up making a life-changing connection with Sam. There are also the two other constants in Riggan’s life: his best friend and producer of the play Jake (Zach Galifianakis) and his actress girlfriend Laura (Andrea Riseborough) who alternately pull him toward and away from his most self destructive impulses. Adding what seems to be the voice ever taunting Riggan toward insanity, is his alter-ego, Birdman, who shows up, sharp-beaked and feathered, whenever he is alone long enough for introspection. The film, like the play within it, is written and directed in a sort of Raymond Carver/Howard Hawks script and direction mashup, where babbling, rambling, blunt-isms are spoken by cast members who are constantly interrupting each other, and performed with very little space between lines. Carver’s work is always about the curdled American dream, turned not only sour but rancid, causing each character as they interact, to drag all those around them down into their gin-soaked, tar-stained personal hell. The films of Howard Hawks are more about characters bouncing problems and solutions off each other, examining how to keep hope intact, through a balance of strength and vulnerability. In Birdman, these two influences converge and blend with the filmmakers’ own quirky aesthetic. The film is shot to look like one big take, with no edits, as done in Hitchcock’s Rope, or the opening sequence of Orson Welles’ A Touch of Evil. This technique is more than just a trick. It allows the audience to get fully immersed in the proceedings by making us a part of the show and of RIggan Thomson’s life, as well as a part of its potential disintegration. There is also this quality of magical realism to the story, in that there are fantastical elements that can’t be distinguished from the more mundane. Riggan levitates, for example. Is that part of the world of the movie, or Riggan’s reality, or his insanity? As the construct of this cinematic journey, how real or imagined is what we see and experience with him? Will it be revealed, or are we meant to be as confused as the characters in this story? The verisimilitude of using both Keaton and Norton’s real lives, mining their celebrity and personal histories for use in their characters, makes the balance of a harshly pessimistic reality and more fantastical elements of the screenplay all the more powerful. The visual atmosphere of Birdman creates desperation and frenetic energy, the dialogue mixed with the quirky drum solo-based score creates aural chaos, and the story creates an uncertainty about what is real and what is imagined. There is also an intentional and pervasive dinginess to the production design, that is punctuated with rare scenes capturing the romantic nostalgia of New York City. It is like hopelessness and hope, juxtaposed. Even with all the passionate, compellingly cinematic storytelling director Inarritu holds together, (which is tailor-made for repeated viewing), it is Keaton’s portrayal that drives the movie, and makes it so memorable. If we all think back on when he was at the top of the Hollywood A list, he has already proven himself repeatedly in roles as diverse as Beetlejuice, Night Shift, Clean and Sober, and Live from Bagdad. In a beautiful parallel to the success to which his character in Birdman aspires, Keaton has now proven we all of us can do our best work when those around us are most in doubt. That affirmation speaks to us all, and that is why we should care about Keaton and about Birdman.